There are so many! I’ll start by saying that this list will be incomplete, and that I’ll probably realize with a terrible clarity — and while pouring milk or driving or sleeping or something — that I’ve made an omission. That being said, here is my (incomplete) list: Hannah Dela Cruz Abrams’ The Man Who Danced With Dolls, Jessica Smith’s Trauma Mouth, Quinn White’s My Moustache, Kristina Marie Darling’s Melancholia (An Essay), Julianna Gray’s Anne Boleyn’s Sleeve, Katie Bowler’s State Street, and Ross White’s How We Came Upon the Colony. I think that perhaps it’s the form of a chapbook itself, as well as what that form does to the content, that’s my biggest inspiration. It’s kind of the diamond of the literary collection: the brevity creates a different kind of constraint by applying more pressure than the full-length collection or book-length narrative. Under that pressure, language — along with its patterns and processes, its stories and structures – is purified and hardened, with all excesses burned away. 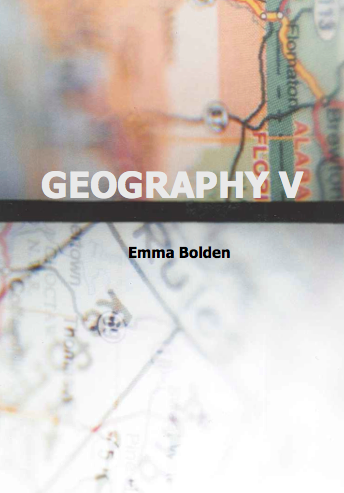 Geography V began with an ending: specifically, it began with the ending of my last serious relationship. It began with a sentence I wrote and then erased, a sentence that doesn’t appear anywhere in the published text: Who says the last love is the one that lasts? For years, I had faced love both in my life on the page and in my life in the world with a singular and circular focus, as it if it were the only thing that could save me. The essays began when I asked myself why I was waiting to be saved, why I didn’t just save myself, and, most importantly, why I felt like I needed to be saved in the first place. I realized that I fantasized about love in the same way that people fantasize about a great inheritance from an unknown benefactor, a person who doesn’t even know you but recognizes the worth within you. I realized that love wasn’t the problem: I was. I couldn’t recognize the worth within me and so I recognized love as a fantasy, though I couldn’t recognize the heartbreak this created both for me and for the people I so singularly and excessively loved. My writing began in the moment that became the image that ends the book: me, standing in the middle of an unused room, looking at the unplugged lamps and random boxes and disassembled pieces of furniture. It began with me looking at those boxes and those pieces and all of those empty spaces and realizing that though I had been hurt, I had also hurt others. I realized that by believing so fiercely and singularly in love as this fantasy of salvation, I had forgotten that I was human and that the men I loved were human. I had done terrible damage. I said to myself, Okay. I had some major reckoning to do, and I wrote until I’d come as close as I could to that reckoning. I kind of approached writing in the same way that I approached confession: as a way of moving through the narratives I’d made out of my life and recognizing that I was neither the hero nor victim, and that I was often the villain. I wrote in the third person, as looking at my I as a she helped me to understand not what others have done unto me but what I had done unto others. It helped me with my reckoning by giving me a way to confess the wrongs that I had done to the page, to the people I had done wrong to, including, importantly, myself. Did I succeed entirely in this reckoning? Probably not. Of course not. Even if the I is she in the narrative, it is still me, and it was still a difficult thing — even though I knew it was necessary, even though it was my main intention — to confess all of the wrongs that I and she had done. I also cycled through Lucinda Williams albums on a constant loop, which seemed like an important part of the writing process. I chose the title Geography V, which I borrowed from Elizabeth Bishop’s collection, Geography III, for a lot of reasons. In many ways, my relationship with Bishop’s work has followed the same kind of circular orbit as my relationship with love itself. At first, I hated her. I’m willing to admit it. I came to her work as a teenager, and to my thirteen-year-old self, her poems seemed so stodgy, so removed, so quiet and stoic in comparison to my other poetic first loves, like Anne Sexton and Sylvia Plath and even, and in a lot of ways, Emily Dickinson. Later, these would be the very traits that brought me back to Bishop’s work, this time with a ferocious fanship and yes, even love, for her language. However, even as an angsty teenager hellbent on writing confessional poetry while listening to Tori Amos’s Boys for Pele (also on a constant loop), one Bishop poem astounded me: “In the Waiting Room.” In the poem, Bishop remembers sitting in the waiting room and flipping through an issue of National Geographic while her aunt visits the dentist. There’s this moment where Bishop has a dizzy realization of herself existing as a self, as an Other to her own view of her own self, just like her aunt and the women in the magazine. “[Y]ou are an I,” Bishop writes, “you are an Elizabeth, / you are one of them. / Why should you be one, too?” Since I had tried in these essays for that kind of sense of self – or, rather, the ability to see my self as a self — I pilfered Bishop’s title, partly for the aforementioned reason, partly as a nod to Bishop from my dawning realization that all of her work had been right for me all along. Winged City was really wonderful and willing to collaborate with cover design. I wanted an image that combined the ideas of distance I play with in the essays, distances that are measurable and immeasurable. I found an old map in my floorboard and an old star map in my closet, and then I found my old manual camera from high school. I remembered how to use it enough to get a few successful double exposures, and that’s the cover image. I think that there can be a stigma against chapbooks out in the writing world – some people assume that if you publish a chapbook, you won’t publish a full collection. My advice would be to ignore this (and, really, most) advice. A chapbook-sized collection is a very complete collection. It feels like an entirely different art, and one that writers shouldn’t be afraid to practice. How was this project personally relevant to you? This is the kind of question that writers often resist, especially in the academic culture of creative writing programs. There are no clear and measurable outcomes when it comes to one’s personal relationship with writing and the relationship between writing and one’s personal life. This semester, however, I’m teaching a group of very courageous young writers who write with a passionate but skillful fearlessness that I admire and, admittedly, envy. Their bravery extends to the way that they talk about writing, and that extends to the sometimes-academically-taboo idea that writing does something – and something terribly, vitally important – for us as human beings. I’ve been inspired by their bravery to consider this question in my own life and writing, and I think that Geography V, perhaps more than anything I’ve ever written, did something – something terribly, vitally important – for me as a human being. Since the essays are about love, it is perhaps no surprise that the thing they did was to bring me (terribly, vitally important) closure. As I wrote, I came closer and closer to coming clean. I came closer to the kind of reckoning that involves a recitation of sins, the kind of reckoning that includes a summation of accounts but moves beyond summation into reconciliation. After I’d finished this series of essays, I realized that a period of my life I finally ended. There’s another meaning of the word reckoning, a meaning that involves settling, a word that instantly brings to mind one of those phrases we use when we talk about love: settling down. That’s what Geography V helped me to do. It helped me to settle the boiling conflicts of my life, the endless circular obsession with love, the endless search for a rescue that, of course, I secretly knew from the beginning I could only bring to myself. And so I settled down, finally, with my first love: language. I am happy to report that we are very seriously happy in the home we’ve made together. Which piece is the “misfit” in your collection and why? Oh, “2030.95 Miles,” no doubt. The essay is about my experience with an online sexual predator; though it’s often discussed today, that wasn’t really a topic often discussed in 1990-1991, which is when the events takes place. It’s actually something I never talked about before I wrote the essay, so it felt like a huge risk – and in many ways, a huge surprise — to me. It’s also very different from the rest of the essays, especially in terms of chronology. I fought with myself over whether or not to include it, but, in the end, it feels like the cornerstone of the collection. Does your family read your chapbook? Oh Lord no. Or at least I hope not. My parents have been incredibly supportive of my writing from a very early age, and I’m certain that without their continued support, I wouldn’t be writing today. One of the incredibly supportive things that they did was allow me to audition for the creative writing department at the Alabama School of Fine Arts; I was accepted and started my studies there in eighth grade. Over the course of the next five years, my parents went to a lot of readings and read a lot of my work, and, given that I was angsty and Plath-obsessed and listening to Tori Amos (on a constant, constant loop), one can imagine what that would be like. They were patient and wonderful and supportive, even when my work was at its most angsty. It’s perhaps for that reason that I feel kind of protective of them now, and I give them a head’s up about what might be difficult for them to read. It’s difficult enough for me to read this chapbook, so it’s on the NSFF (Not Safe For Family) list. Emma Bolden is the author of two full-length poetry collections — Maleficae (GenPop Books) and medi(t)ations (Noctuary Press, forthcoming) — and four chapbooks — How to Recognize a Lady (Toadlily Press), The Mariner’s Wife (Finishing Line Press), The Sad Epistles (Dancing Girl Press), and This Is Our Hollywood (The Chapbook). Her work has appeared in such journals as The Rumpus, Prairie Schooner, Conduit, and Verse, as well as Poetry Daily. In 2014, she was the winner of Gulf Coast’s Barthelme Prize for Short Prose, Prime Number Magazine/ Press 53’s Contest for Flash Nonfiction, and the Spoon River Poetry Review Editor’s Prize. He said worse things to her than she ever thought she would hear. She said worse things to him than she ever thought she would say. She woke up in the morning and watched the light and the blinds and her cat’s paw grow larger as it moved towards her nose. The room was still a room. It was still and the air inside of it was still. She wanted to take it all back. She wanted to never take anything back. She made coffee in the French press she bought in the week his things still lived in her house. The French press was made of glass, no plastic, and the coffee was the free trade dark Italian roast coffee he loved and she hated. She’d told him she loved it. Even as she’d said it, she knew it was a lie. She bought pressboard bookcases. She moved the vanity three times until it became a desk. She sat in the floor in the room that was no longer his room. She bought a round rug with a gray outline of flowers that flowered into Technicolor, into orange and purple and blue. She curtained and blinded the windows. The wall became the space without the bed he was supposed to sleep in when she snored. Instead, there was a series of lamps trailing their cords. She cried until she felt satisfied, then stood to mop the floor.